Are you a landlord, leasing agent, or property manager? Could you use help with tasks such as screening, signing, and managing tenants? What if you could streamline the whole process with one simple rental management software? NowRenting is an easy to use rental management software that helps to streamline all of your renting needs. It is just the right software to help keep track of your rental properties. Here are a few of the many ways that Now Renting makes renting easy. It can be difficult to keep track of everything when you are running a property, especially if you are working with multiple locations. 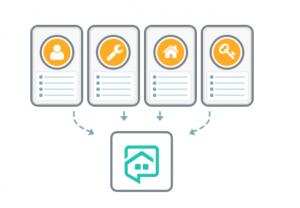 Now Renting organizes all of your communication with tenants into one inbox. It also helps keep track of any leads that are interested in your rental property. NowRenting streamlines your communications with tenants and leads in order to stay organized and never miss a message. It also records all conversations and stores them in a single spot if you ever need them for reference. Posting to dozens of different listing sites can help to broaden your reach in order to market your rentals. However, having to post to each individual site can be more time-consuming than its worth. NowRenting helps you market your rentals on dozens of listing sites without taking up your time. All you have to do is create a listing once, and it will be posted for you on dozens of listing sites. This way you can save time by letting your rental management software market your rentals and spread your post. It often can be difficult when renting or leasing a property to find quality tenants. Asking screening questions and deciding on the best candidate is a tedious and time-consuming task. NowRenting does it all for you. When people contact you about a listing, they are automatically sent screening questions to help see if they’re a good fit. NowRenting filters and ranks potential leads based on their answers. This way all you have to do is pick which lead to choose. Staying connected and available to your tenants is an important part of running a rental property. NowRenting allows tenants to easily make a maintenance request through an online portal. This way, any maintenance need is seen quickly and can be acted upon accordingly. Now Renting also makes it easy to communicate with tenants about rent. You can send an automatic rent reminder to tenants to help avoid missed payments. You can also enable tenants to pay their rent and access or renew their lease online. Renting doesn’t have to be difficult. NowRenting ensures that you are organized, your tenants’ needs are heard, and rent is paid on time. NowRenting helps to improve the overall efficiency of your business. If you are ready to get organized with rental management software, visit our website today.